Please read the frequently asked questions below for more information. -I'm looking at your bath and body products. Are any of these products tested on animals? 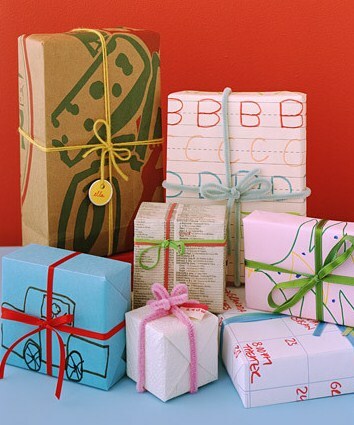 -Can I purchase really unscented products from The Soap Exchange? -What can I use to clean my car? -Do you sell a car wax? -Before I call the plumber do you have products that will open my drains but will not harm my septic tank? -What can I use to clean my glass-ceramic cook-top? -Help!! What can I use to get grease out of my carpet? -Is there an air freshener that has no fragrance? -Do you have Himalayan Rock Salt Lamps? -Do you always have Wind Chimes in stock? -We have young family members who have asthma and eczema. Do you have a laundry detergent that will not irritate these conditions? -Can I use your laundry detergent in my new H.E Front Load Washing Machine? -Will I notice a difference in the laundry when I start to use your laundry detergent? -Stains, Stains, Stains. What have you got? -I'm making my own creams and butters. Do you sell containers that I can use? 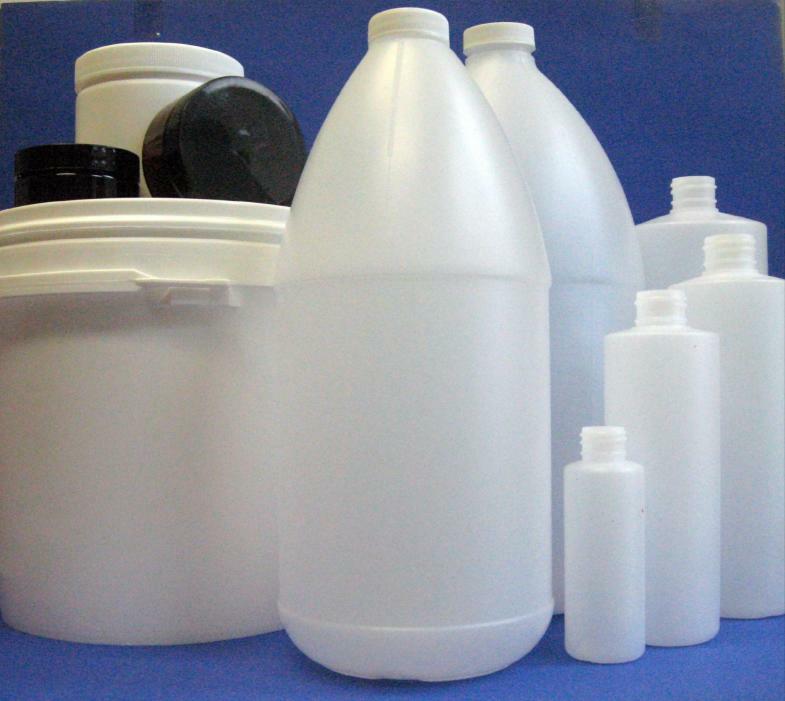 -If I buy product in bulk do you have smaller containers to make it easier to handle on a daily basis? -Sometimes when pouring my soap, I notice tiny bubbles on the surface. When I am making layers sometimes I get these bubbles in between the layers. What can I do to prevent this? -I'm having trouble making layered soaps. I let the soap harden between layers, but when I un-mold the soap, the layers separate. What am I doing wrong? -Sometimes I have difficulty getting the soap to come out of the mold, what can I do? We have young family members who have asthma and eczema. Do you have a laundry detergent that will not irritate these conditions? Yes!! All our laundry detergents, liquid and powder, and our laundry aids are developed with absolutely no harsh chemicals. 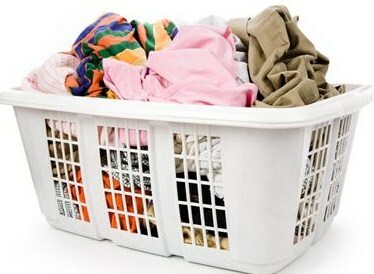 I would suggest Enviro Wash - Our hypo allergenic answer for you laundry. I suggest Enviro Wash to you as this laundry soap has stain removing compounds for active young families and is available unscented or a light lemon scent. Laundry soaps traditionally use fillers to give the product volume.This filler product is a mixture of a variety of various things including chopped up cardboard, plastics (petro chemical by-products) and paper. A lot of these fillers and oils can definitely irritate asthma, eczema, psoriasis, allergies and even acne. Can I use your laundry detergent in my new H.E Front Load Washing Machine? Yes!! Enviro Wash and Terge, our liquid laundry detergent is HE compatible - so whether you use a regular washer or an HE machine - this works in both. Will I notice a difference in the laundry when I start to use your laundry detergent? Yes!! After about 10 washes with our soap you will actually finally get all the fillers cleared of your washing machine from your previous soap. Many people come in and tell us that they feel their clothes are softer! Many tell us how fluffy their towels have become and how much more absorbent they are.That's common. There are no fillers to clog up your clothing and bedding anymore so you actually start feeling the natural cloth once again!You tell us what you think! Stains, Stains, Stains. What have you got? We have two excellent stain removers that will save you lots of stress and keep those favourite pieces of your wardrobe wearable in public! A wine stain definitely requires the use of our Stains Free product. Stains Free will remove most organic stains including coffee, sweat, urine, blood and yes even wine! Simply pre spray your stain and let the product work for 3 to 5 minutes before putting through your normal laundry cycle. In most cases that is all you need. Stubborn stains may need to be lightly scrubbed or even just let soak longer in Stains Free. The accidental spill of olive oil on a nice dress shirt, or a spouse or child that gets grease and oil on their clothing requires the use of Stains Out. Stains Out will take on the bigger challenges of oils, grease, butter, grime, lipstick, grass, and ground in dirt. Same procedure as with Stains Free. Both products can be used on whites and color fabrics! What can I use to clean my car? We have several products to help you clean your car. Here is a few options. We have glass cleaner - in 2 different styles. See Thru is an alcohol base product that is ammonia free and leaves no streaks. Klear Vu is our aerosol foaming glass cleaner. The right product for you is truly based on your preference.They are both very effective products and very cost effective on your pocketbook! Another life saver in the auto area is our Peel Power. It removes gum and tar, oil, grime, adhesives, paint, grease, asphalt, shoe polish and even pen ink.Only one word accompanies Peel Power. Dilute - Dilute - Dilute for the job you are doing. On hard surfaces simply wipe on and let stand for 5 minutes and wipe clean! On carpet leave 5 to 10 minutes and use a putty knife to remove leftover residues. It is also very effective on many stains in carpet as well. Peel Power can be used on the exterior of your vehicle as well to remove tar. oil, grease. and asphalt splashes or build up. Peel Power should not be used on car paint that is less than 6 months old. Got some nasty odours to deal with? Someone smoke in your car? Pets have a little accident? Whatever the issue Enzymes is your answer in elimination of odours.This is not a scent masker - it is a true biological product that truly goes to the source - bacteria. Enzymes is a true odour remover even with pet urine smells! One customer recently came in and someone had been using his vehicle and smoked heavily in it. He could not stand it! One night he sprayed down the interior - everything cloth and carpet - even the sun visors and headliner - and left it overnight! When he got into the car in the morning he was amazed as the whole car smells brand new - not even a hint of the previous occupant smoking. But - a warning - depending on the problem odour - and the length of exposure - some jobs do require 2 or 3 repeats for complete removal of all odours. Do you sell a car wax? Sorry - one of our most often asked questions - we do not have a car wax. Before I call the plumber do you have products that will open my drains but will not harm my septic tank? Insert a Septi-Saver in your toilet tank. Use the toilet at the furthest point into the home at the beginning of the sewer line run.This would be the highest point in the home. Every time you flush you are adding product into your lines that reduce any overall system build up in your lines and at the same time keeps your toilet bowl clean and fresh - and the water blue. Each Septi-Saver lasts approximately 3 months. Enzymes is a biological bacterial culture product that is specially formulated to quickly unclog, clean and deodorize garbage, wastes, fats and grease in drains and septic tanks. It is non-toxic, 100% natural and biodegradable, formulated for quick action. It will quickly neutralizes foul odours and digests organic and protein wastes. Pour 2 ounces (4 tablespoons) of Enzymes down your drains every day for the first 7 days. After the initial shock treatment you then fall back to a weekly application of two ounces per week. Again the treatment program is based on volume of the average 2 person household with average use. If household has additional persons increased product needs to be added to correspond with the increase volume of use. Pour the solution down any problem drains and let sit. This is best done at the very end of the day just as the last person goes to bed for the night allowing the product to sit in the drain lines for a longer period before flushing further down the line. These products are biological and you do not use chemicals such as acids, disinfectants, or chlorine based products in the system without harming the results of our products. These chemicals will harm or kill microbial activity and change the effectiveness of our products. What can I use to clean my glass-ceramic cook-top? The trick is a non-abrasive cream cleaner that will both remove stubborn stuck on food, and minimize stains and scratches. Enter Ship Shape. To get your cook-top looking as good as it can, just follow these easy steps - a small amount, maybe the size of a quarter, of Ship Shape to a clean dry cloth. In a circular motion apply the cleaner - adding more to the cloth as needed. If you're trying to remove the baked on Nacho cheese from last nights' midnight snack, use a soft brush to apply the lotion. Wipe down with a damp cloth making sure to remove all the cleaner before making your next gourmet creation! Help!! What can I use to get grease out of my carpet? Use Stains Free (organic stains) or Stains Out (grease & oil) for stains on your carpet and furniture. Spray liberally, agitate if needed then rinse out. To do this use a wet cloth and use your body weight on it to draw up the stain and cleaning surfactants. Repeat till satisfied. (Cleaning surfactants left in the carpet will just attract dirt to that spot). Don't rub, it really doesn't work. With the wide range of dyes used in the wide variety of fibre products on the market - be sure to test the products on an obscure area first to ensure color hold. 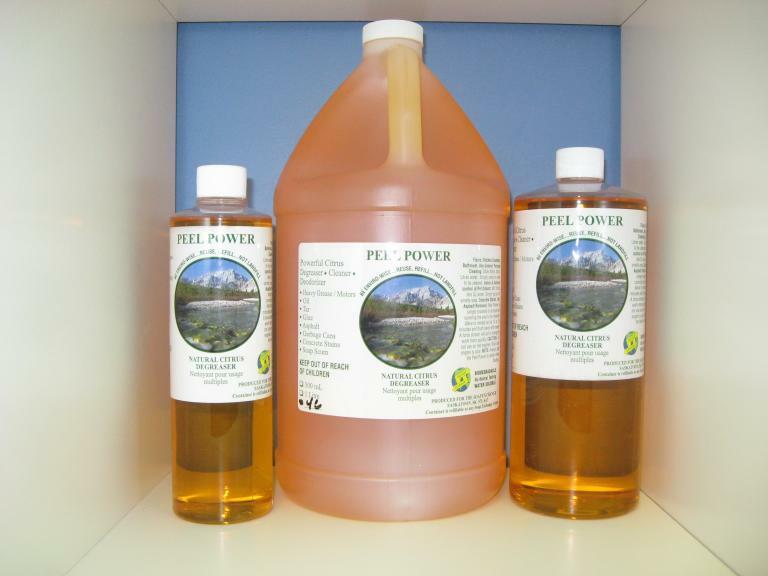 Our Peel Power is also an excellent stain remover for any stains that are petroleum based - grease, oils, etc. If you have any questions or concerns of the type of stain you are faced with call or email us and we will be very happy to direct you into the right solution! Is there an air freshener that has no fragrance? Get some fairly instant relief with Enzymes. Enzymes is a biological product that is designed to perform quickly and effectively. With Enzymes all you need is one or two squirts ... leave the room for 15 to 20 seconds ... and come back to a very refreshing room! No kidding! The active ingredients in this product search out the odour causing bacteria and immediately encapsulates it and chokes off the offending odours to give you instant relief. Then continues working to break down that bacteria so that the odour will never return. Although Enzymes is definitely well known for its performance in the washrooms don't forget that it can also be used anywhere odours bother you! Your dog's favourite spot on the carpet, refreshing your furniture or drapes, downstairs in the musty rooms that don't see much activity. It works well as a full household odour remover. Anywhere odours persist - Enzymes will work for you! It is recommended that oils should be stored at 20 degree Celsius (room temperature) and out of direct sunlight. Refrigeration after opening is best. Sometimes when pouring my soap, I notice tiny bubbles on the surface. When I am making layers sometimes I get these bubbles in between the layers. What can I do to prevent this? After pouring the soap, when you first notice the bubbles, spray a bit of rubbing alcohol on them. The bubbles will almost immediately dissipate, the alcohol will evaporate, and the finished look will be beautiful. I'm having trouble making layered soaps. I let the soap harden between layers, but when I un-mold the soap, the layers separate. What am I doing wrong? When making layers, you cannot let the soap fully harden before pouring the next layer. 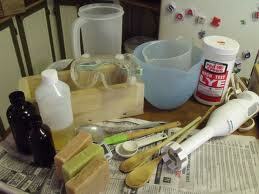 Pour your first layer, let the soap set just until a thick "skin" forms on the soap, and then pour your next layer. Spraying alcohol between layers will also help them adhere to one another. Sometimes I have difficulty getting the soap to come out of the mold, what can I do? When properly heated and prepared the soap fills the mold completely and creates a bit of a vacuum. You have to turn the mold over, and apply steady, even pressure until you see the air seal break. Once the air seal breaks, the soap will easily come out of the mold. I'm looking at your bath and body products. Are any of these products tested on animals? No, none of our products including the bath and body products are ever tested on animals. Can I purchase really unscented products from The Soap Exchange? Yes, our Magic Touch Hand & Body Wash comes unscented. Also you can get unscented Celestrial Revitalizing Hair Shampoo and unscented Celestrial Natural Hair Conditioner. I'm making my own creams and butters. Do you sell containers that I can use? Yes, we have the amber jar with screw top. Sizes are 60ml and 100ml. If I buy product in bulk do you have smaller containers to make it easier to handle on a daily basis? Yes, we have bottles ranging from 60 ml to 4L and 2K and 4K pails. 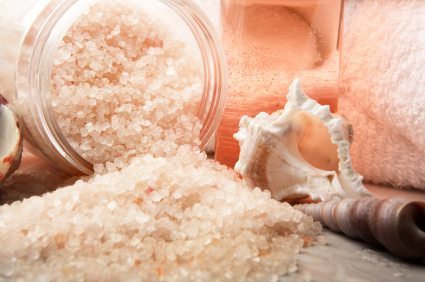 Do you have Himalayan Rock Salt Lamps? Do you always have Wind Chimes in stock? Yes. We have Carson Chimes and Amwell Chimes all the time and seasonal of course during the summer season.